Erev Shabbat this week started out very stressful for me. My daughters don’t get out of school until 3 p.m., and I have to pick them up from my ex’s mom’s house, which is about 16 miles away. 16 miles away, you say? Not a bad drive – 20 minutes, right? Try an hour and a half at that time of day. It’s awful. I can’t get there sooner, because the kids won’t be home yet. Getting there later means even worse traffic going back home. Welcome to Southern California. So I spent most of the morning doing work that I could do: cleaning up the kitchen from the Rosh Hashanah meal the night before, setting up exams for my students (four of my six classes have an exam starting on Sunday morning, and not all of them were up yet), answering emails, doing a gasoline-and-grocery-run with the fiancé now that his check for the week had arrived; the usual stuff. I had one more exam to finish when I left at 2:45 to pick up my kids, and I knew that my fiancé would be at work that evening because that’s how his work runs and we can’t make them let him off for my religious holidays. I got to their home at 4:15. We took streets home and that was another hour plus, with a stop at the grocery to pick up a couple things I’d forgotten in the earlier grocery run. We didn’t arrive home until close to 5:30. So I decided that from now on, Shabbat starts when I light the candles, because no way was I going to be able to bake challah AND make dinner before sundown. Daughter #2 helped me make the entire Shabbat meal, and both daughters took over cleanup when it was done. Shabbat meal, though late, was lovely: raisin-honey gluten-free challah (I made three loaves: two braided-mold and one piped-spiral crown challah); apples with honey (natch), tomato-garlic soup, plain potato kugel (which Daughter #1 LOVED – which is great, because she’s a picky eater), roasted chicken thighs with spices, Kedem grape juice for kiddush, ice water. I had planned on a dessert of apples and strawberries with Greek Gods honey Greek yogurt, but we were all too full! And I cooked for armies; we had enough soup to fill two quart containers, four pieces of the chicken, half the kugel, and even some apples left over. 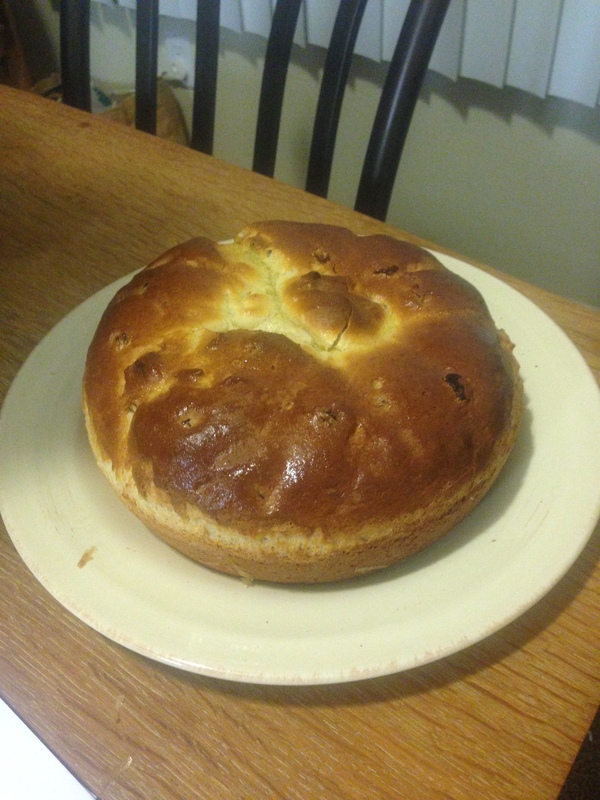 To make the crown challah, I put a little over a third of the batter into a plastic bag and turned it into a giant piping bag, and piped it into a round baking pan in a spiral. I ran out of batter just before I would have been able to make that little spiral on the top, but it was definitely recognizable as crown challah. I was pleased. The kids also stood with me while I said the blessings, lit the candles, and said kiddush and ha-motzi. We put away one of the braided loaves, and the round loaf for kiddush at temple this morning (about which, more later) but the one loaf we left out disappeared halfway through the meal. I think Daughter #1 got most of it. I finished putting together the last exam, and then I collapsed into bed and slept the sleep of the righteously exhausted until pretty late this morning. I didn’t wake up until nearly 9 a.m. The fiancé and I went to temple while the kids stayed home, which was fine. I was running on coffee and a bagel; I didn’t realize that my fiancé was running on short sleep and only a cup of coffee until halfway through the service. He had to get up and leave for a while. It was also not being run by the rabbi; he was with the B’nei Mitzvah seventh-graders at a thing at the park today, so it was the other fellow leading the services. He’s a great guy, but he’s not the rabbi, and my partner’s patience was very frayed due to hunger and headache. It was also awkward when he led us in “I am a Jew because…” as the main prayer and made a point of saying “I don’t want those who are our non-Jewish guests to feel excluded.” Um, dude… that’s only for me to mention, okay? I also wondered if I wasn’t allowed to say this prayer yet. Awk-ward. On the other hand, the crown challah we brought with us got a very happy reception when the worship leader lifted the challah cover and revealed not just their usual big loaf of regular challah but our little gluten-free crown loaf. The response was this sort of breathless chorus as it was revealed: “CROWN challah!” to which the worship leader responded by explaining a) it was gluten-free and b) the significance of a round loaf during High Holy Days. Everyone tried it. It was slightly more cake-y than I’d hoped, but it still tasted good. The alterations I’d made to the recipe (increasing potato starch and decreasing all-purpose gluten free flour, adding two more eggs and a half-cup of honey, and adding raisins) really worked well. I got asked to submit the recipe to the new Sisterhood temple cookbook. Then we came home to the discovery that Daughter #1 is without her anxiety meds for the weekend. We’re all trying to be patient with her; it must be hell for her. So we’ve all eaten (mostly leftovers) and now we’re at our corners of the apartment, trying to take the day easy. After havdalah tonight, I’m going to be back on the emails and student work stuff. But for now I’m going to rest. Tonight I’m going to do some grading so that I can start making headway on it and not be wiped out all day Sunday doing nothing but grading. But that can wait until after sundown when the day changes. It is a new year, and time to be a sanctuary. That’s what the rabbi’s sermon at my shul was about tonight. … to be a sanctuary to myself, and a safe place to land when things are hard. … to be a sanctuary to my partner and my best friend, that they might find peace and comfort. … to be a sanctuary to my daughters, that they might find help and understanding. … to be a sanctuary to my friends, that they might find companionship and connection. … to be a sanctuary to my students, that they might find wisdom and knowledge. And finally, to be a sanctuary to Adonai, that he might dwell beside and within me, and that I might learn the thirteen attributes of mercy in the coming year. L’shanah tovah tikatevu – May you all be inscribed and sealed for a good year.